Ezzy Freewave: a new light-weight wave sail with a flatter profile. 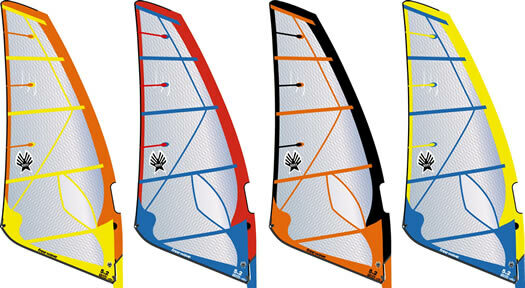 Suited for all levels of windsurfers, especially freestylers and sailors who prefer a flatter shape. The Freewave’s effortless rotation makes it excel in jibes and transitions. The Freewave contains no monofilm. The main panels are made of our ultra strong Spectra X-film which provides strength and great visibility throughout the body of the sail. The tack panel utilizes our higher density Spectra X-film in the foot area to resist harness hook tears and nose-of-the board punctures. RBS battens and a vinyl window that won’t scratch. The Freewave also features our new downhaul and outhaul rigging indicators that give you the correct settings for light, medium and strong wind conditions. Every Freewave is rigged in our factory. We tune the battens, set the adjustable top to the correct mast length and go over every inch of the sail to make sure it is perfect. That means when you get to the beach you and your Freewave will be ready to go. After using the new Ezzy Freewaves in 5.8 and 5.2 quite a bit whilst out coaching in Rhodes and enjoying them so much i was itching to get out on the 6.3 which was back in the UK. The 6.3 had the same attributes as the other freewaves – smooth power delivery, very stable, light in the hands and an excellent tuning range. The fact that the sail has less shape than the 08 wave SE and 09 wave panther meant it was very easy for freestyle and for flipping in gybes. With the boom length coming down in both the freewave and the wave panther in the bigger sizes (6.3 to 5.2) they feel really throwabout.